This year’s 50 most iconic red carpet looks – as chosen by us. 2017 was a year that served up a multitude of swoon-worthy red carpet outfits. From the Cannes Film Festival, to the Met Gala, and Bella Hadid to Celine Dion’s mega style moments, we were spoilt for choice putting together this list. However, it had to be done. So without further ado, find below our list of this year’s most beautiful looks from the red carpet. Naomi Campbell pays tribute to the late Azzedine Alaia at the British Fashion Awards. Bella Hadid proves she is queen of Cannes Film Festival in Alexandre Vauthier and Bulgari. Blake Lively wearing Alexandre Vauthier at the Golden Globe Awards. Arguably this years Most Improved Player in the fashion stakes, Céline Dion wears Versace at the Met Gala. Céline Dion killing it again in Zuhair Murad at the Grammy Awards. Cara Delevingne rocks a Chanel suit at the Met Gala. Elle Fanning looks every bit the floaty princess in Rodarte at Cannes. Kim Kardashian West wore Vivienne Westwood to the Met Gala and it’s hard to believe she was once blocked from the infamous event. Lily Aldridge in Alexandre Vauthier Couture at the Victoria’s Secret after party. Lily Collins wearing Zuhair Murad at the Golden Globes. Michelle Williams in a stunning Louis Vuitton dress at the Oscars. Millie Bobby Brown looking every bit the ballerina in Calvin Klein at the Emmys. Rihanna slays the Met Gala yet again in Comme des Garçons. Emma Stone in Chanel at the BAFTAs. Lorde in Monique Lhullier at the 2017 VMAs. Selena Gomez in that infamous Coach dress at the Met Gala. Emily Ratajowski somehow combined pantsuit and a gown in Dundas at Cannes. Viola Davis showing us how to do yellow right in Michael Kors at the Golden Globes. Teresa Palmer shows off her killer post-baby body in Armani Prive at the Golden Globes. Emma Stone looking amazing in Valentino at the Golden Globes. Olivia Culpo in Zuhair Murad at the Golden Globes. Hailee Steinfeld somehow making muscle-cut tops and floral appliques work in Ralph & Russo at the Oscars. Kate Bosworth wearing J. Mendel at the Vanity Fair Oscars party. Isabelle Huppert looking incredibly chic in Armani Prive at the Academy Awards. Miranda Kerr is a floral dream in Oscar de la Renta at the Met Gala. Lily-Rose Depp is every bit the Chanel princess at the Met Gala. 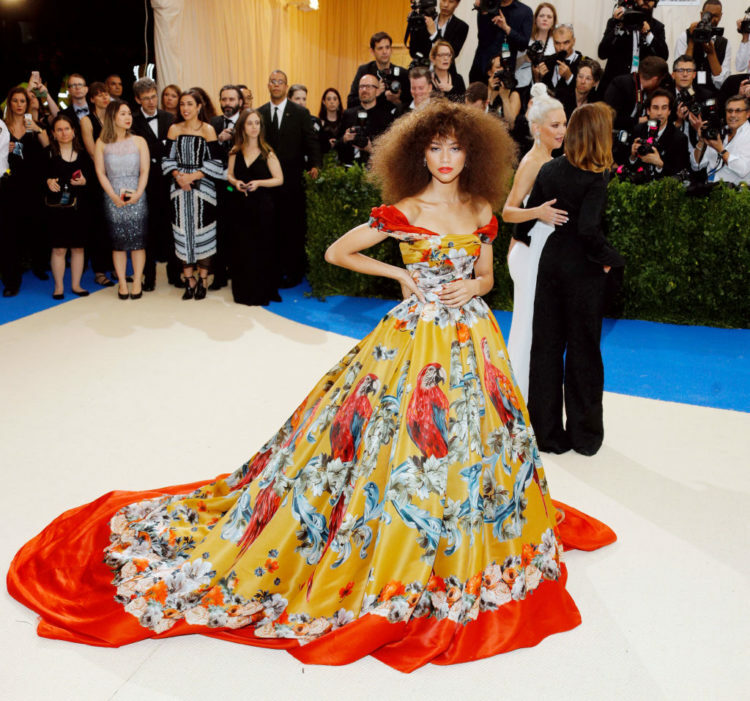 Zendaya in the Dolce & Gabbana gown we all wish we could rock at the Met Gala. Elle Fanning in a unicorn-inspired Vivienne Westwood dress on the opening night of the Cannes Film Festival. Winnie Harlow in Zuhair Murad at Cannes. Lily Donaldson in semi-sheer Dior at Cannes. Bella Hadid tapping into last years iconic Cannes look in Dior. Rihanna proving she is the only woman who can wear shades on the red carpet, here in Dior at Cannes. Natasha Poly in Ulyana Sergeenko at Fashion for Relief Gala. Bella Hadid in Ralph & Russo for the AMFAR Gala at Cannes. Rihanna working it in Giambattista Valli at the European premiere of Valerian And The City Of A Thousand Planets. Julianne Moore in Valentino at the Venice Film Festival. Jennifer Lawrence in Dior at the Venice Film Festival. Stella Maxwell in a Twinset dress with a thigh-high split at the Venice Film Festival. Viola Davis in Zac Posen at the Emmys. Zoe Kravitz giving us serious feather inspiration in Dior at the Emmys. Thandie Newton wearing Jason Wu at the Emmys. Kim Kardashian West shows us how a suit should be done in Gucci at the LACMA Art and Film Gala in LA. Gigi Hadid (in Zuhair Murad) and sister Bella (in Cristina Ottaviano) serving up sister outfit goals at the Glamour Woman of the Year Awards. Kaia Gerber in Ralph and Russo at the British Fashion Awards. Arizona Muse in custom Emilia Wickstead at the British Fashion Awards. Winnie Harlow showing us how to rock cashmere on the red carpet in Brandon Maxwell at the British Fashion Awards. Kiernan Shipka wearing Miu Miu at the Emmys. Kendall Jenner wearing Giambattista Valli at the Cannes Film Festival. Karlie Kloss killed it with both her red carpet and after party looks at the Oscars this year, wearing a Stella McCartney gown to the main event, and Naeem Khan to the after party. Rosie Huntington-Whiteley proving maternity wear can be glam in Versace at the 2017 Vanity Fair Oscars after party.